This product from Chess Baron: Free Shipping for UK. Garde Chess Clock. This German brand is generally regarded as the best of analogue chess clocks both for classic looks and for robust reliability. The case is made from solid wood (rather than the usual plastic) and the mechanism is German to give guaranteed reliability. 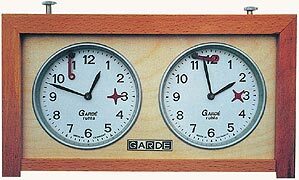 This is the only mechanical clock available today that has been used in a world championship match (Kasparov -v- Short, 1993). The clock measures 9 in x 5 in x 2 in - with the clock faces being 3 inches in diameter. They go on forever, like the ever ready bunny (except you have to wind them up occasionally...). They're made to endure. They're made to look great. They're made as a world class chess clock and are always in first place for quality ranking. That's German engineering!